The weather was perfect and the company, divine! 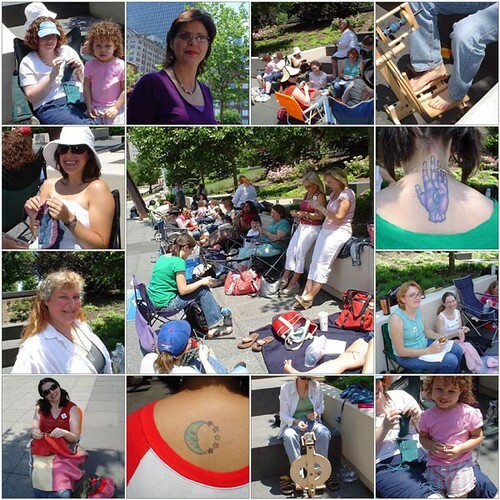 Any way you slice it, World Wide Knit In Public Day 2007 was a rousing success in Chicago. Thanks so much, Natalia, for pulling off this year's Millennium Park fête in such a fine fashion. What a gorgeous collage of pictures. I was a bad blogger and only took a couple of pictures once we were all packed up to go. great photos!! i'm so glad i didn't miss it even though i was late. Great collage! I had to knit one day in advance for the WWKIP Day, but I was there in spirit. Alas, the body was with ten or so 7-year-olds at a birthday party. Good job to everyone that made it out where ever you live! Super. Lot's of sun in the windy city! thanks for the pics! they gave me a chance to see what i missed. it was great to see you, if briefly. hope you are feeling better! Looks like a great time!! You know I knit all the time in public. I always take my knitting. I knit while my daughter plays at the park...I knit out front while the kids play, I knit on the bus and I never have ever in the last year seen someone else knitting in public....until this morning on my walk!!! A lady knitting on her front porch. I was so so tempted to go up and say hi.